Typically, when we think of caravans we picture weekends away in dingy caravan parks with soggy socks and wet, windy weather conditions. It’s never glamourous, chic or pretty – that’s for sure. 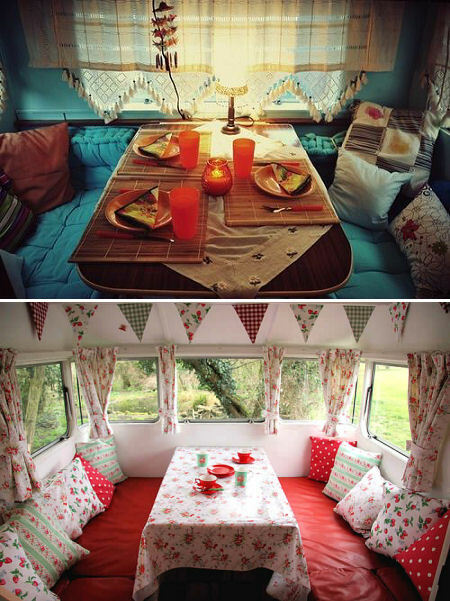 However, if you happen to have a caravan sitting forlornly in the garden, festering and forgotten, there are a few simple things you can do to transform that musty old van into a completely new, appealing space. As house prices continue to rise week on week, and with extensions becoming ever more expensive, caravans provide the perfect way to get some extra needed space in your home on the cheap. Whether you work from home or just like to pretend to, having a tranquil escape away from the hustle and bustle of family life is not so much a luxury as a necessity. The easiest way to change your dining space into a homely office is by building a desk on top of the dining chairs. Or if it’s a complete overhaul you fancy, you can rip out the entire dining area, and build in a sleek, curved desk. Plus points: you’ll get views of the great outdoors from the window, and it’ll come with its own office kitchen already installed. Minus points: your wifi might not extend into the garden so you may need to invest in a dongle. Once that’s sorted, all you need to do after that is sit back and look busy. Voila – garden/home office complete. 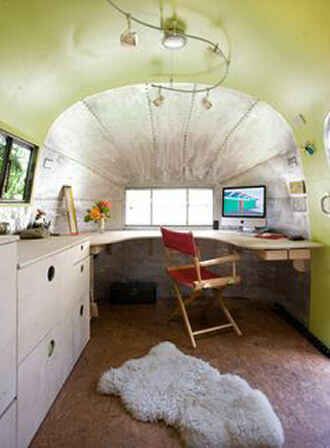 Even Google uses caravans as mini office meeting rooms. This is by far the easiest transformation as everything is already in place, simply awaiting the magic touch of a little interior creativity. Cover your old, scratchy seat cushions with something funky and new (which you can do laboriously by sewing machine, or speedily just by tucking the edges of the fabric underneath), and then make or find some mini curtains to match. If you add some fresh flowers and candles you’ve got the perfect indoor/outdoor dining retreat for dinner parties, or an alternative ‘eating out’ location for two. There are occasions when we are all desperate to get away but often time, and budget, restricts us. 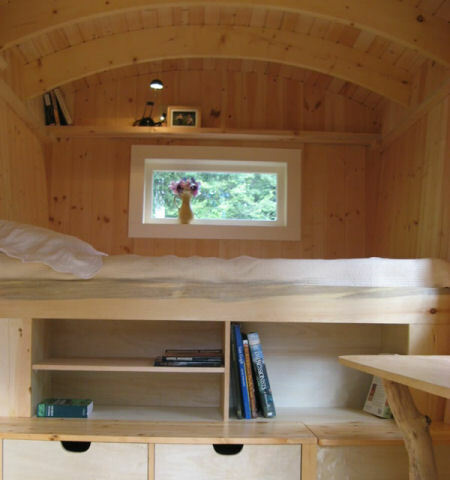 It doesn’t take much, however, to turn your caravan into a snuggly, garden-based getaway. Get some coloured fairy lights to create a soft mood, add some cosy, patterned throws and rugs, and most important of all, keep the fridge well stocked with wine. If you really want that hotel experience, buy things in miniature – soaps, shampoos, even little bottles of alcohol, as this will add an extra touch of luxury for when you need a break. This cubbyhole can also double up as a sleepover spot for teens, or an indoor/outdoor space for entertaining guests; perfect for when you’ve just cleaned the kitchen and don’t want those grubby prints all over your sparkling floors. This one is a little more extravagant, and for those who are always on the go. Turning a motorhome into a mobile food-van, a roaming library, or even a temporary café is the stuff of daydreams for those who long to be their own boss. You don’t necessarily need the most high tech van, either. The experts at caravan dealership Salop Leisure suggest: “You needn’t invest in a food-specific van. 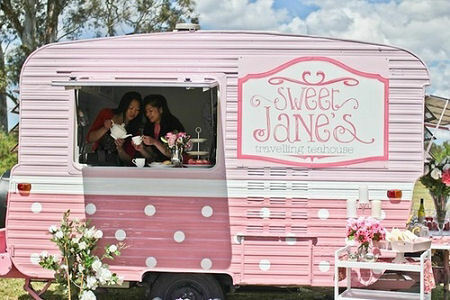 If you simply attach an awning, you can set up vending tables outside and use the inside of the van for refrigeration and storage purposes.” This is a great option for budding bakers and cupcakes lovers wanting to test the waters with self-employment; simply bake at home and sell your wares at car boot sales, festivals and other local events at the weekend. All literary fiends have dreamed of having their own in-house library, but most of us don’t have the space or the money to afford one. Lining the walls of your caravan with funky shelves and bringing those beloved books out of storage is a great way to make use of your caravan, and also to get the family reading. Make sure you don’t load the walls down too much by strategically scattering the shelves and having some stand-alone bookshelves in place. 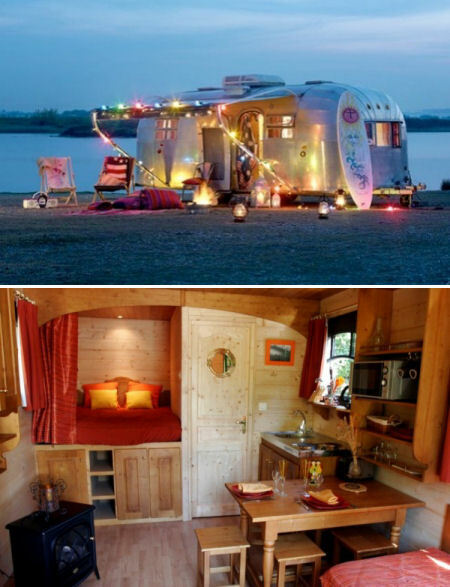 Do you have any other creative ideas about how to transform your caravan into an additional space for your home? Let us know! We’ve always believed that there is something special about a traditional silver black and white photograph and it seems that many interior designers and stylists agree. The reason that stylists like Ceril love using our images in their designs is that the right image or group of images can help to complement whatever theme they have styled a room around. Many of the images on our site have a ‘retro’ feel to them and this is complemented by the way that they are printed using traditional photographic chemicals here on our site in leafy Cheshire. The traditional darkroom methods also contribute to the longevity of the prints, meaning that mounted and framed under normal conditions they should last for at least 70 years. We’re always happy to chat with anybody who is looking to buy an image and to help them find one that they love from our selection. 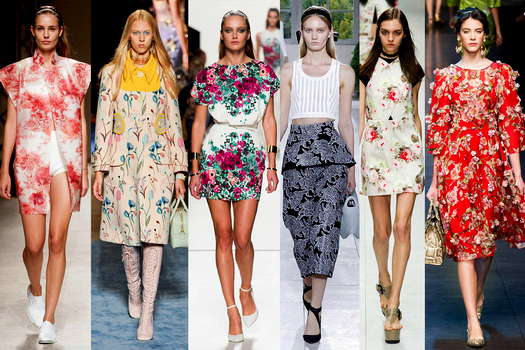 Should your home be flowery, just because your dress is? It’s nearly July and dedicated fashionistas will be turning their attentions to Autumn & Winter’s styles; their Summer wardrobes picked out months ago. But does it follow that, to be truly in vogue, what’s hot on the High Street should be reflected in your home? 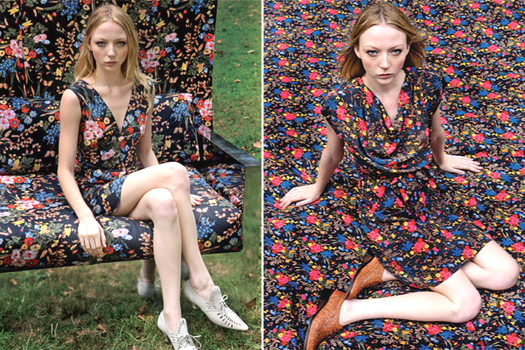 A hallmark of Spring / Summer ’14 has been the rebirth of flower power; maybe not as brash as in its ‘60s heyday but, nevertheless, livelier than Jerry and Margot’s chaise longue! 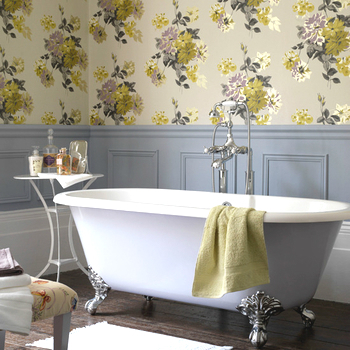 With floral patterns set to continue through Autumn & Winter, does your home décor need to echo that flowery dress? Should interior design mimic clothing styles? Perhaps the main difference between interiors and clothing is the fleeting nature of sartorial style. Before the High Street has a chance to catch up, leading designers have moved on to next season’s looks. We do our best to keep our wardrobes in check, but to extend that through the home would be a major undertaking – both practically and financially. Clothes and interiors do share a similar function though. We dress ourselves and our homes as an expression of our personality. We’re unlikely to wear something that feels uncomfortable, just as we might not choose to paint our walls neon yellow – even if it was the season’s colour. Clothing designers present a collection of styles, from which we select the elements that suit us best. 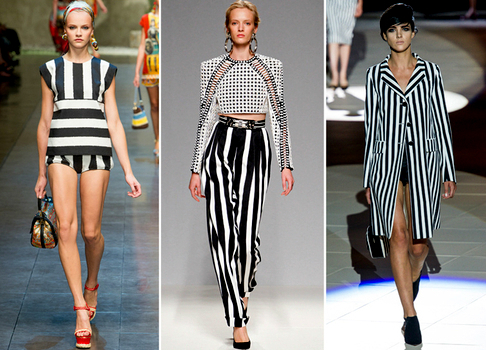 A three quarter length coat might drown a petite frame, but its monochrome colour scheme could be just your cup of tea. Various uses of monochrome – it’s not all black and white! Good design always suits its era. 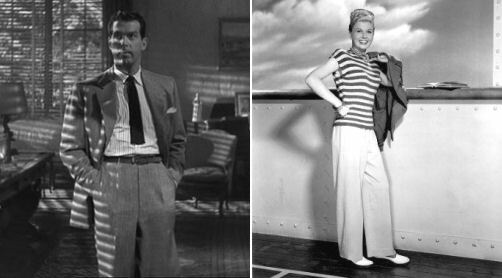 ‘40s and ‘50s styles were built around post-war austerity, innocence and traditionalism. 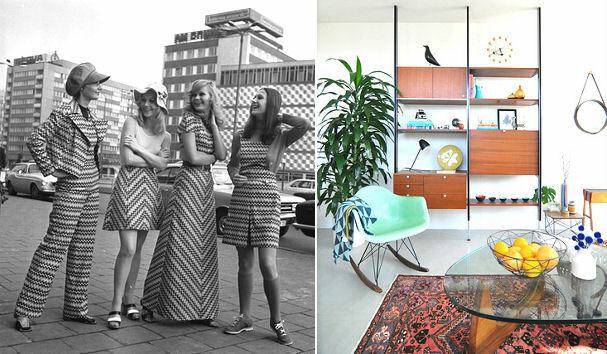 Modest wooden furniture and window blinds characterised interiors, while clothes were utilitarian, simple, and chic. 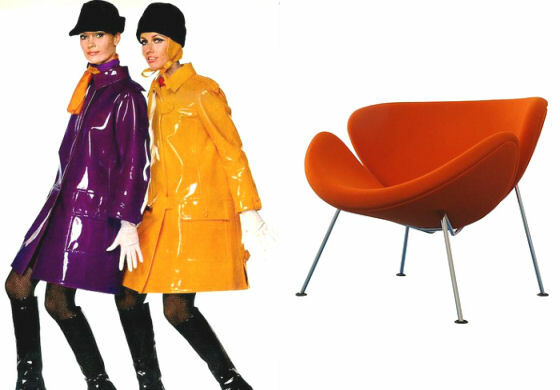 Designers in the ‘60s were pushing boundaries – colours and shapes were brighter and bolder, and the materials used were at the forefront of technology. People were excited about space travel and psychedelics, and metals and plastics were used in futuristic ways. At the same time, the hippy movement took us back to the earth, with flowers and natural materials the order of the day. The ‘70s maintained this split personality. Experimentation was taken to overblown proportions, but equally balanced by subtle, Scandinavian minimalism. The number of styles covered over these few decades show how quickly fashion develops from one trend to the next; the constantly changing seasons only helping to spur it on. Interior design changes at a naturally slower pace. It’s like a go-to outfit that you change-up by varying its accessories. Imagine deciding on an outfit that you had to wear for the foreseeable future. The same kind of thought is involved in designing interiors but, fortunately, we can turn to stylists who are in tune with the zeitgeist! Trends are a great thing for keeping us on our toes, but it’s what we choose to do with them that truly shows personality – and makes fashion and interiors such an exciting area of work. 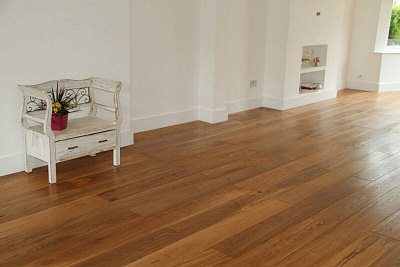 Natural wood is a stylish flooring solution that can suit many interiors. If you are considering natural wood, you will soon come across technical terms that may appear to complicate the process, unless help is at hand. In this guide we aim to explain your options, should you decide to venture in the direction of natural wood during your next interior design project. Types such as natural, solid, engineered, wood effect and others often come across confusing. Your first decision is deciding as to the most suitable type based on your project’s requirements. 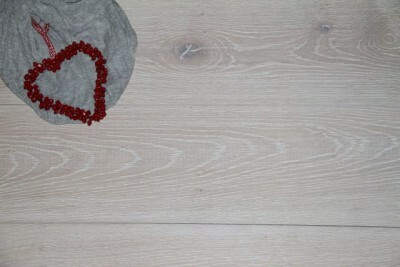 Solid Wood – Floorboards of the solid type are made from 100% natural wood. 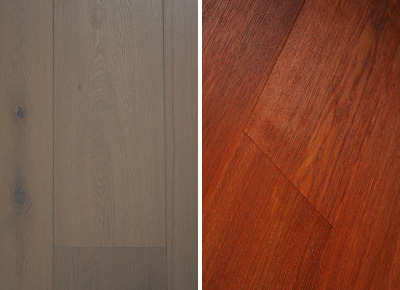 When clients first think of wood flooring, the solid type is often the only one they are aware of. The solid type suits most surroundings, unless fitted in damp or humid areas. In such areas, the likes of which are the kitchen or bathroom areas, natural wood may expand when the temperature rises and contract when the temperature drops. Overtime, this instability can damage the wood. Engineered Wood – Floorboards of the engineered type are made from 10% to 25% natural wood placed on a core of MDF, Plywood and even Softwood. The first visible layer typically 3mm to 6mm thick is made from the same natural wood as used in the solid type, though the bulk of the floorboard is made from alternative matters. This combination of materials means that an engineered floorboard can be fitted across the entire project, even in damp or humid areas and even on top of under floor heating. Wood Effect, Laminate and Vinyl – These floorboards are made from synthetic materials such as wood fibers, plastic and even recycled materials. They contain no natural wood, but made to look similar to wood by copying visuals such as sapwood, grain markings, knots and colour. 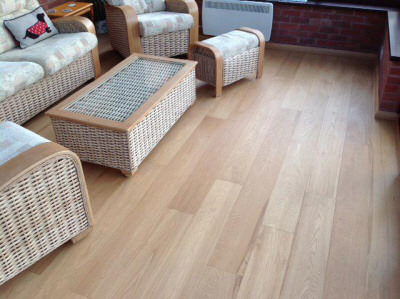 Wood effect, laminate and vinyl are substantially more affordable than real wood flooring, therefore in certain circumstances such as when the floor is to be laid on a tight budget, they are worth considering. After deciding on the type, comes the creative part of deciding on colour. In most circumstances, wood flooring comes in shades of golden honey. When clients come across colours such as white wood flooring, dark and even bold black they are often amazed at this outcome. In truth, over the years manufactures developed techniques to colour the floorboards to make them suitable in a greater number of projects. 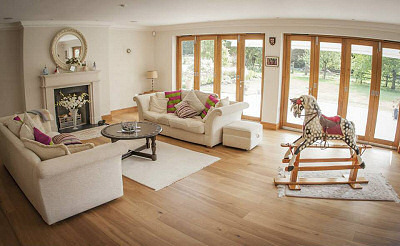 White Wood Flooring – These solid and engineered white flooring are exceptionally popular in recent years. Each floorboard is painted over using diluted white paint and therefore referred to as white washed wood. 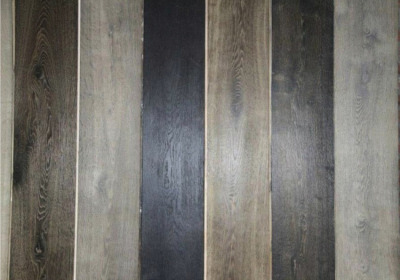 Dark Wood Flooring – These solid and engineered dark flooring are exceptionally popular in heavy footfall areas as they hide daily wear better. Using an industrial oven, the wood is baked and therefore often referred to as thermo treated wood. Depending on the length of the process, the outcome can be dark wood or even solid black. Bold Colours – Grey, yellow and even red can be achieved. Your interior designer will know what is available and the best means to procure your desired colour. The last considering after choosing type and colour, again takes a creative form. Texture refers to the look, feel, appearance, or consistency of the wood flooring surface. 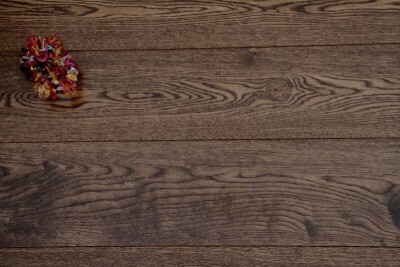 Together with colour, the look of each floorboard is also determined by grade. 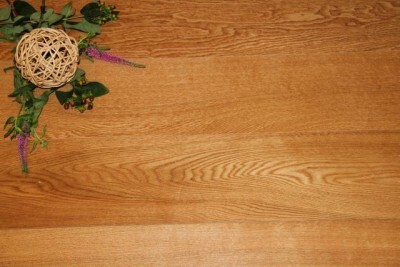 In its natural state, wood contains features such as sapwood, knots, grain markings and colour fluctuations. Premium grades such as Prime and Select present a uniform look in which these natural features are toned down. Country and rustic grades are the basic grades in which sapwood, knots, grain markings and colour fluctuations are widely present. It is a matter of personal taste, some people prefer a uniform look, others more rural. The feel and appearance is traced back to your choice of coating. Coating is a chemical layer that is applied to reduce wear and tear. It comes in the form of oil or lacquered material. Oil finish wood flooring creates a smooth matt finish feel, while lacquered finish wood flooring creates a slightly textured surface, and in some cases a glossy finish. Again, it is a matter of personal taste. We hope this handy guide has helped clarify your options. Contact interior stylist Ceril Campbell to discuss your project requirements.